Sorry about the bits and pieces way that I have posted this but time has been at a premium lately. I like to look at maps and for a number of years I have been fascinated by the map of Ray Lake area (63 M/13). 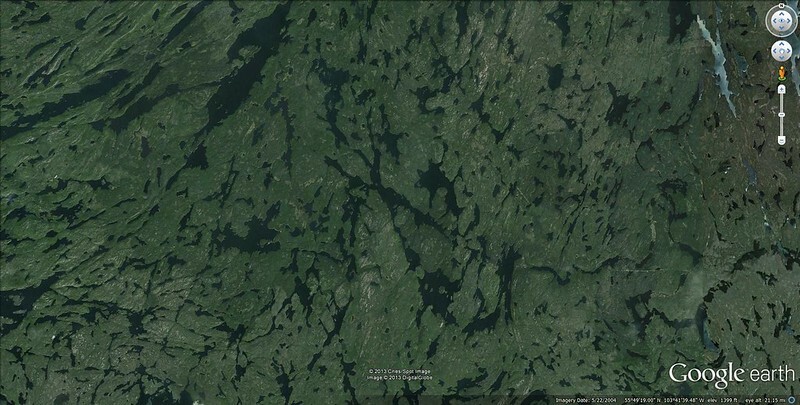 Ray Lake itself has a number of “rays” and connections to other lakes to the east - could one go all the way to Reindeer River? To the southeast – lots of options and possibly another route to Reindeer River. To the south and southwest – to Wapassini Lake and back to McLennan Lake or to Otter Lake, to Coombe Lake, to Glennie Lake, to Kraus Lake, to Pointer Lake, to the Churchill? The problem has always been, how does one get to Ray Lake? There is a large gap between Kelly Lake and Ray Lake. There is a creek that drains from Ray Lake to a large, unnamed lake to the southwest and then from that lake into Kelly Lake. Were there old portage trails along these two creeks? I could not find any information about this possibility. 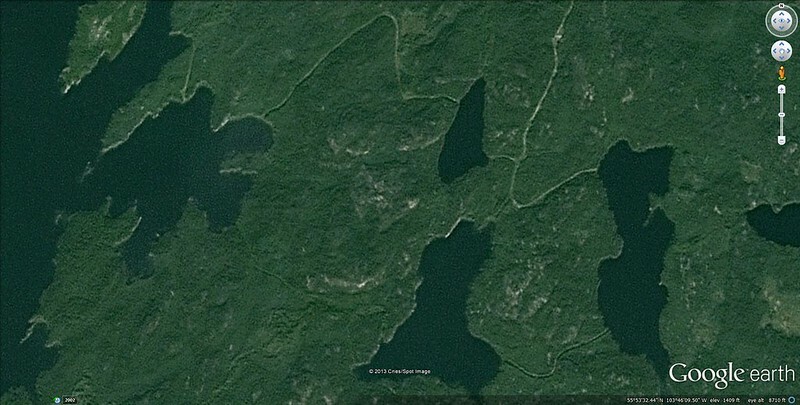 On Google Earth there were signs of old winter roads that connected Kelly Lake with Berney Lake and then Ray Lake. Were these a possibility? This year I decided to give it a go. The basics are outlined below in the trip report. I thought I’d add some background information to the barebones report. I paddled to Kelly Lake and started a methodical search for a route. My first choice, because it seemed to be the shortest, was an old winter road that went directly east from Kelly Lake to a mid-sized, unnamed lake to the east and from there to Berney Lake. 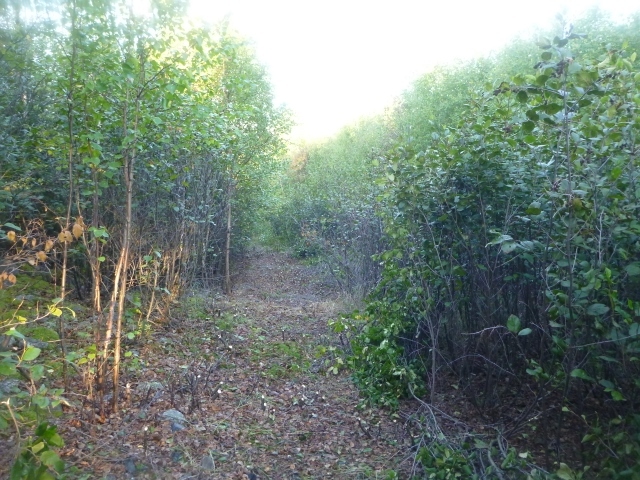 I found the start of this “road” and walked up it for 100 m or so but found that it was choked with a re-growth of large willows, alders and birch. It would take a massive effort to clear a trail so I decided to explore my other options. My next choice to explore was the old winter road that went north out of Kelly Lake then swung east, then south, then east again to a small unnamed lake NE of Kelly Lake. That section was about 1 km long. The road then went east from the small unnamed lake and joined another winter road that came from the north. This road continued south then turned east to Berney Lake. This section of the trail was over 500 m long. I walked up the first part of the road. 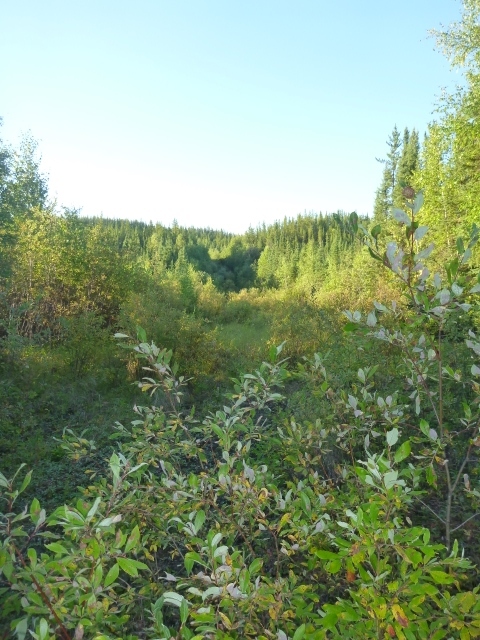 Parts of it were relatively clear of re-growth but significant parts were blocked by 2 to 3 m high willows and alders. I was able to walk all the way to the small, unnamed lake so kept this route open as a possibility. I paddled further down Kelly Lake to where the small creek came in from the east. My first look was not promising. There was a small flow of water coming through a wall of dark, sharp-edged, granite rocks. There was a small pond just above the wall and then, as far as I could see, the creek flowed under a long stretch of boulders. There would be no way to wade or line up that mess and portaging stuff over those boulders did not seem to be a great alternative so the only alternative for this route would be portage trails. I went back to Kelly Lake and searched for a trail. I finally found a very old trail that led from Kelly Lake to the small pond. I was quite excited because I found a way and I like re-establishing old portage trails. It took me about an hour to clear the trail so that it was possible to portage a canoe and gear. Hmmm? I then portaged my canoe and crossed the small pond. After about 15 minutes I found a portage trail on the other side. It seemed to be more used that the first portage trail so I wonder if there was another trail coming from Kelly Lake that by-passed the small pond. (I never did check this out.) 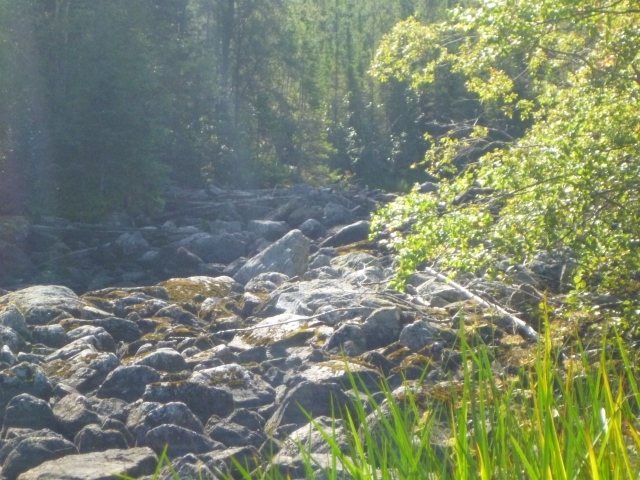 With some difficulty I walked up this trail to a calm section of the creek about the shallow, un- runnable rapids. Sooo, I started clearing this trail but I was running out of daylight and I headed back to camp. I had a decision to make: Either continue working my way up along the small creek – it did seem that the trail would go at least as far as the large unnamed lake to the east of Kelly Lake – or try the old winter road. Time was a factor in my thinking. I had to get out to Brabant Lake and to Missinipe to meet with some friends in a few days. At the rate I was going in my efforts to work up the creek, my time would very likely run out by the time I got to the large, unnamed lake. Would there be trails between the large, unnamed lake and Ray Lake? If so, what condition? I knew that I could get to the small, unnamed lake by going along the old winter road because I had already walked there. Who knew what was in the next sections? It seemed my only real option was to try the old winter road to Berney Lake and then to Ray Lake. I might not make it but it seemed to offer the best chance. Next morning I packed up my gear and went to the start of the old winter road that goes north and east out of Kelly Lake. I loaded up a day pack and started walking and clearing a trail. I spent several hours clearing and, when I got tired of that, portaging my canoe and gear along the trail I had cleared. The road has mild or moderate grades and mostly very good footing. Surprisingly quickly I got to the small, unnamed lake. I was tired but, since I was there, I thought I’d paddle across this lake and see about the condition of the next section of winter road. The first 10 m were a bit wet and spongy but then the road was hard and level with only a few willows and alders. After about 100 m, the old road joined the newer road coming from the north. Wow! It was covered with grass and I felt like I should look both ways for traffic. I followed the trail south then east to the shore of Berney Lake (There was even a sign.). Well, what to do? No more clearing so I decided to go back, get my gear and portage to Berney Lake. I slept well that night. Again, considering my time allotment, I had to allow myself enough time to get back to Brabant Lake so I decided to leave my camp set up and do a day trip to Ray Lake. 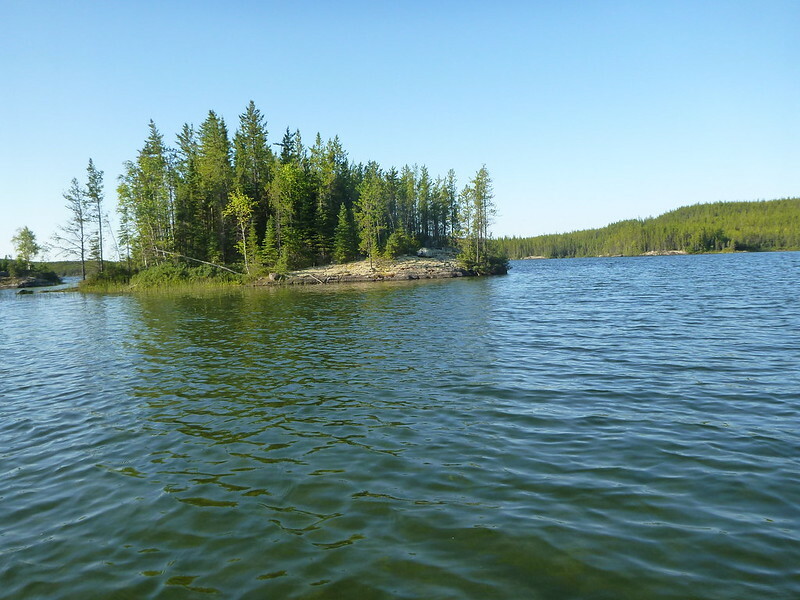 Once I got through the shallow, rocky narrows that separates the northern bay of Berney Lake from the main part of the lake I was extremely impressed with the number and quality of camping possibilities. I crossed to the extreme south end of Berney Lake and found not only that the winter road continued across this portage but that there was a nice sand area extending out into Berney Lake. The portage was 8 m wide, quite level and mostly dry. I paddled down Ray Lake to the middle of the “star” and turned west to go and explore the outlet creek to check for portages. I did not see any definite signs of a trail. 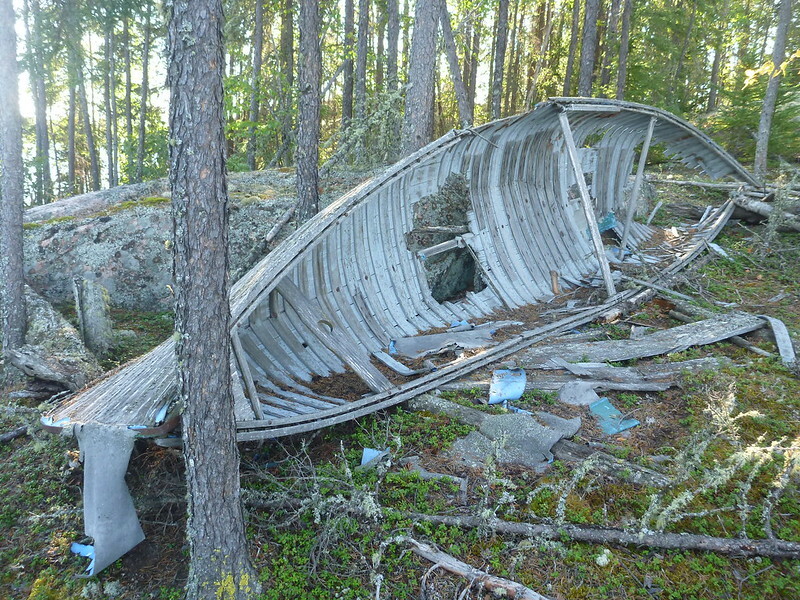 I did find an old camp on a point and there was a large, wrecked, v-sterned canoe. I returned to my camp on Berney Lake. The next day I portaged back to Kelly Lake and paddled and portaged back to Brabant Lake. I camped part way up the lake and paddled the rest of the way to the community of Brabant Lake the next day. Arrangements can be made to leave your vehicle at Can-Am Outfitters in Brabant Lake ($7.00/night – 2013). Travel south on Brabant Lake to the most southeastern part of Doerksen Bay. There is a campsite on the NW side of an island at approximate grid location 64 D/04 – 799154. There is also a campsite on a point at 64 D/04 – 788088 and there is a large campsite (and sandy beach) on an island at approximate grid location 64 D/04 – 809070. Portage #1: Approximately 150 m long and in generally good condition. It goes steeply upward and then steeply downward. 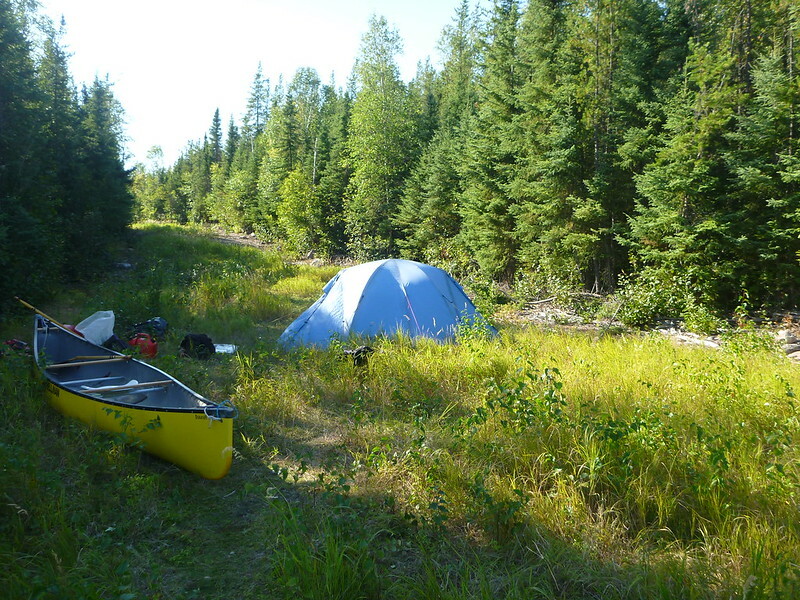 There is lumpy camping for 4-5 tents at the Kelly Lake end of this portage. Travel southeast out of the portage bay and then generally south along the eastern shore of Kelly Lake and enter the small bay at 63 M/13 – 761946. 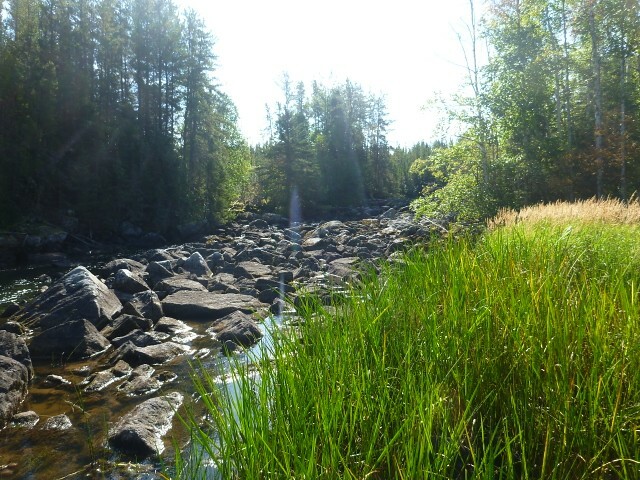 Travel to the start of the portage at 63 M/13 – 766948. 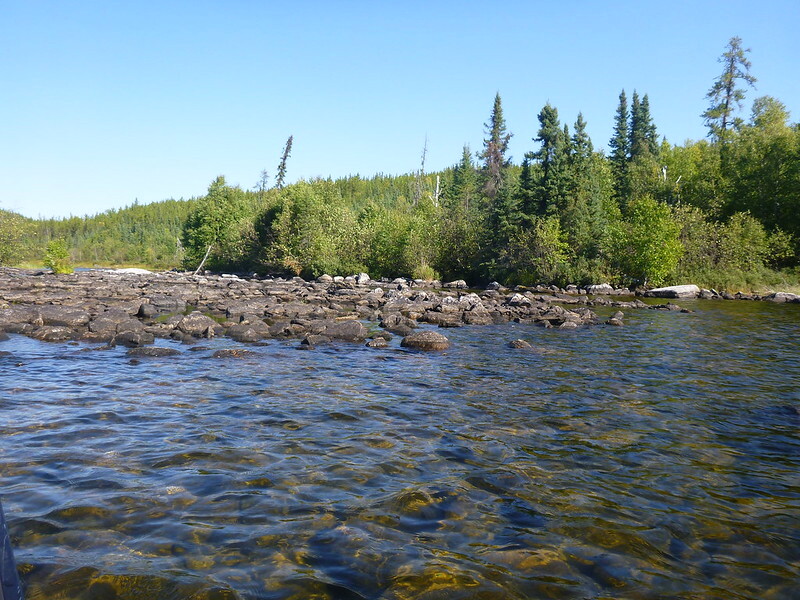 Portage #2: Approximately 1000 m long and in generally good condition. This portage is on an old winter truck road. The road is about 8 m wide and has gentle to moderate grades. 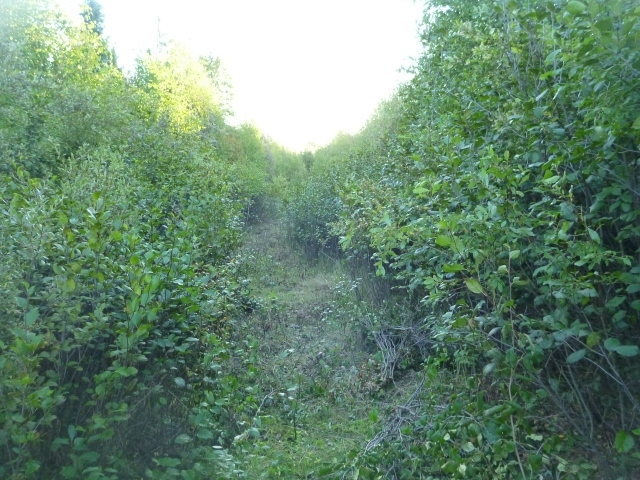 The road has become overgrown with willows and alders in places but a 4-5 foot path has been cut through the worst sections. It ends on the shore of a small unnamed lake. It would be possible to camp on the road near this lake. The path of this portage and the next two portages can be viewed in Google Earth. 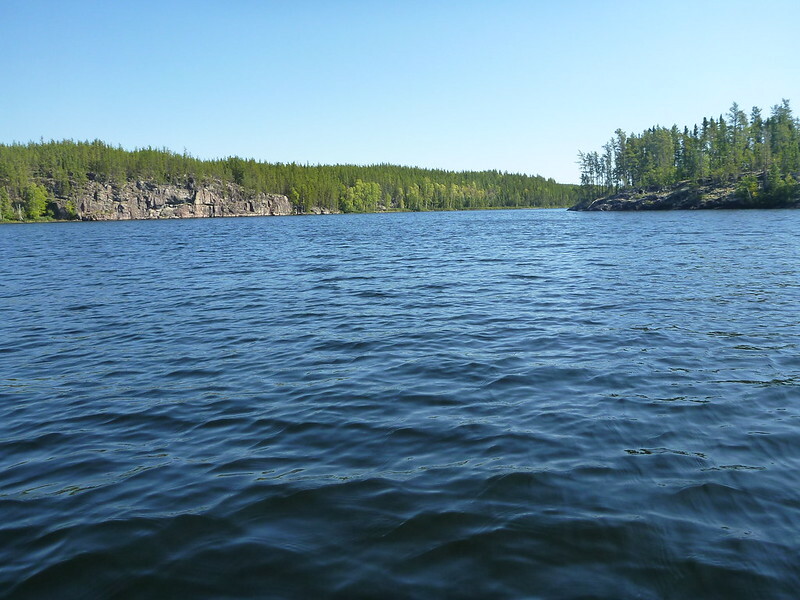 Travel southeast across this lake for about 200 m to the continuation of the portage on the old winter road. 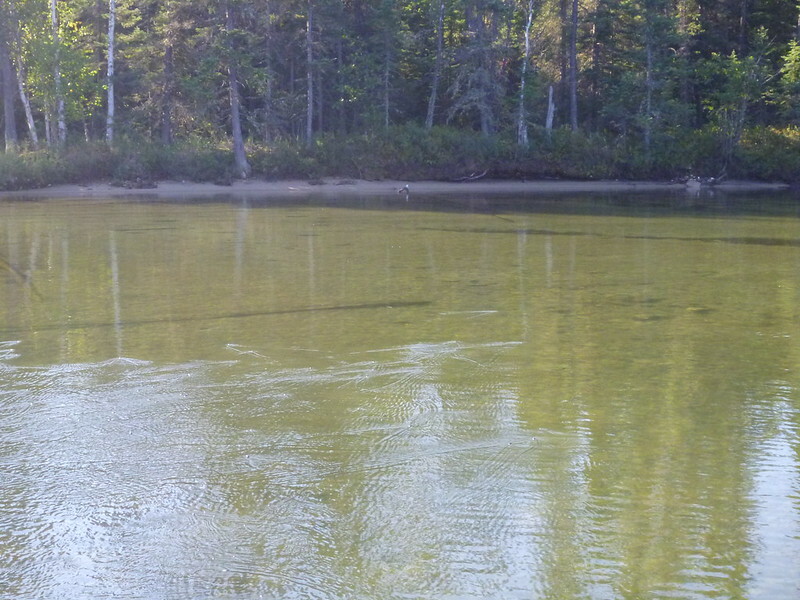 Portage #3: Approximately 525 m long and in good condition. The first 100 m is on the old winter road and then it joins with a newer winter road coming from the north. This newer road continues south and then turns east to the shore of Berney Lake. The trail is wet for about 10 m and then is good. Camping would be possible on the dry portions. The newer road is covered with grass. Camping for a large group would be possible on the road near the shore of Berney Lake. 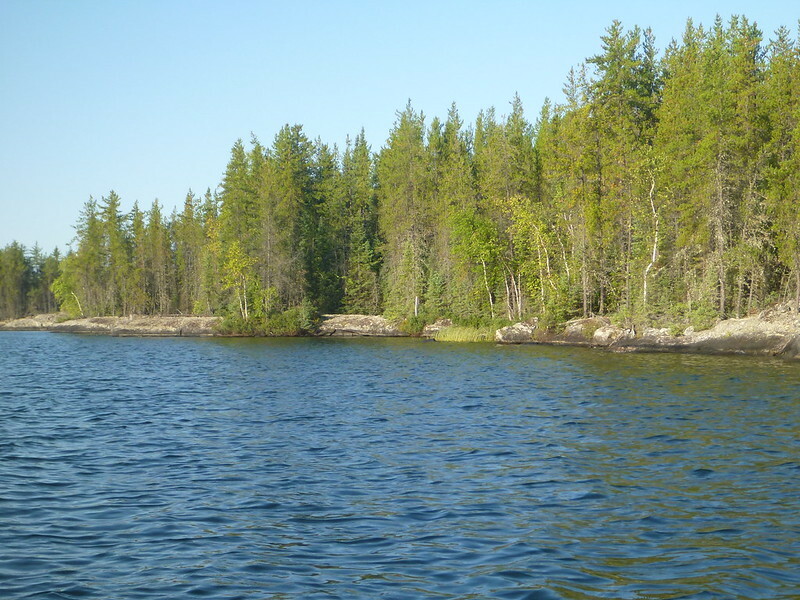 Travel south to the shallow rocky narrows between the northern bay of Berney Lake and the main part of the lake. You will have to be careful to avoid the rocks. Berney Lake has a number of fine, flat campsites. 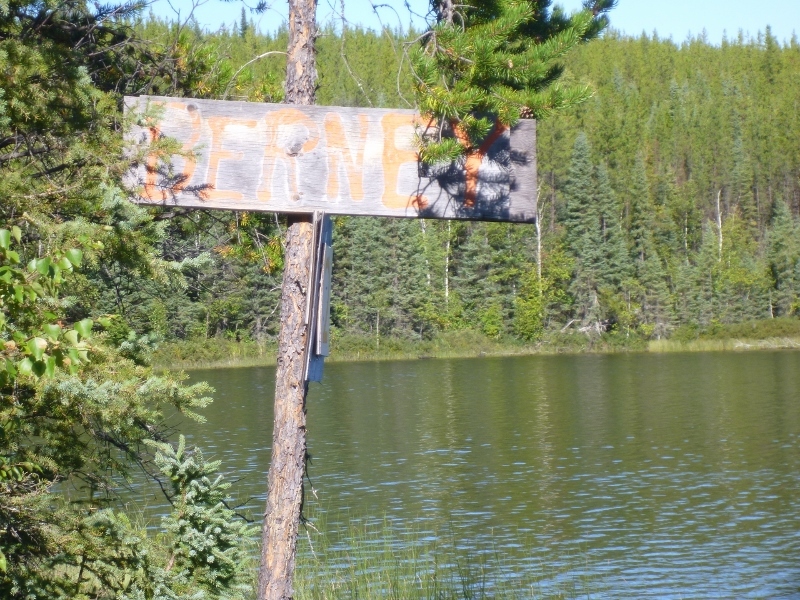 Travel to the south end of Berney Lake to the portage into Ray Lake 63 M/13 - 794894. 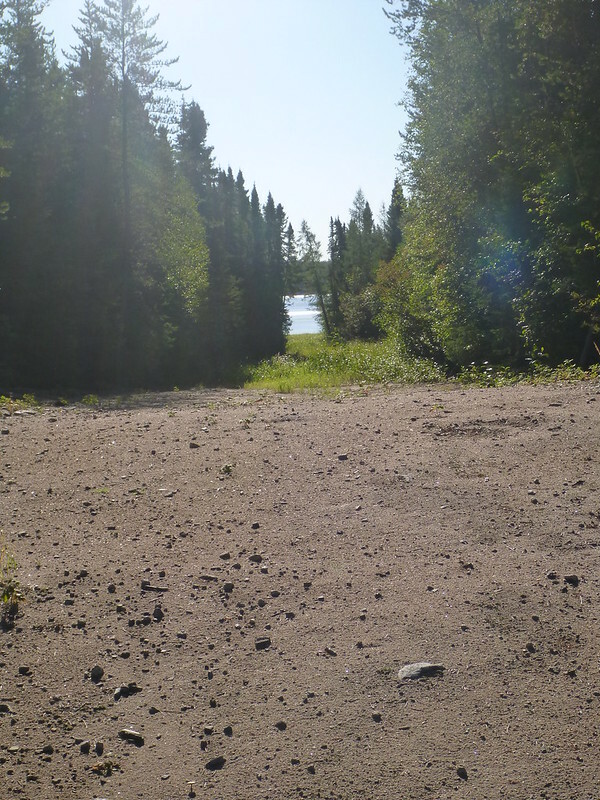 There is a sand beach at this location and camping would be possible on the portage road. Portage #4: Approximately 170 m long and in good condition. 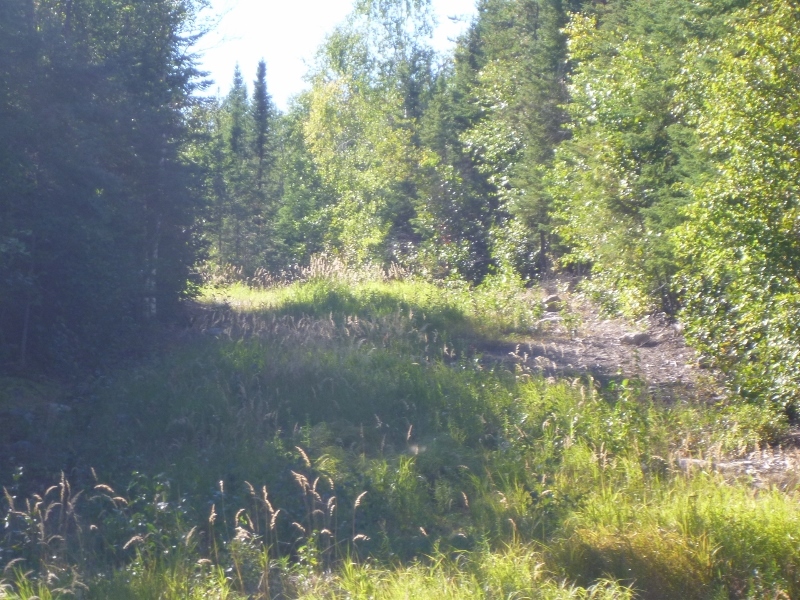 This portage is also on a winter road, is 8 m wide and has very gentle grades. There are many touring possibilities on Ray Lake and beyond. It might be possible to continue further east, south or southwest and to end the trip at various alternate destinations. If you choose not to continue onward, return to Brabant Lake by reversing this route. Last edited by Ralph on September 26th, 2013, 11:20 pm, edited 2 times in total. Post subject: Re: Brabant Lake to Ray Lake - information added. I edited in some more information and thought that others might be interested so... bump. I found it to be interesting reading --even if it is a long way from my home. Very nice report! We often find ourselves using old winter roads or logging roads for ports up here too. Looks like a really nice area! Thanks Ralph! I enjoyed it the first time, going through your descriptions with (electronic) maps at hand. Now, it's even better going through it again with maps and pictures! Thank you for taking the time to post, thank you for exploring these routes, and thank you for giving me more places to want to paddle. You're welcome. I hope you are able to get into that area. There seem to be many possibilities for exploration and/or longer trips. The usual winter roads in northern Saskatchewan are snowmobile trails that usually go through low, wet areas. The winter roads that I encountered surprised me with their width. I'm sure that not all of these go through dry areas but the roads that I traveled were quite dry, level and had only moderate grades. I believe that the ones that I was on are used to haul equipment and supplies to a mine SE of Brabant Lake. There is virtually no logging in this area probably due to distance and a lack of marketable timber so there are no logging roads.